This information is offered as advice based on information supplied by the UK airsoft community, and based on experience with the UK and other authorities. It should not be construed as legal advice, and the IAA will not be held responsible for any loss or damages incurred as a result of following this advice. The Violent Crime Reduction Act 2007 (“VCRA”) bans the sale and import of airsoft guns (which you’ll also see referred to as replica firearms, “RIF” or Realistic Imitation Firearm) in the UK. This is to distinguish it from a “non-realistic” imitation firearm, i.e. a two-tone, a transparent gun, or a children”s toy gun. The representative bodies for airsoft in the UK successfully lobbied for a special defence (an exemption to the law) for an “Airsoft Skirmisher”. That is, if you can prove you are an airsoft skirmisher, you are allowed to buy a RIF and/or possess a RIF in public. Otherwise, you must buy a two-tone Imitation Firearm, where at least half of the gun is painted a bright colour. One common method of proving you are a skirmisher is to have a UKARA number. This is a number issued by the United Kingdom Airsoft Retailers Association, a retailer body in the UK. This is only required for buying a RIF. You do not need a UKARA or AOBA number to skirmish in the UK. If you are taking your own airsoft kit into the UK, with the intention of later taking it home with you, it does not count as import of a RIF. Therefore, as long as you can satisfy the authorities that you are an airsoft skirmisher, and on the way to or from an event or a retailer, you are legally entitled to the defence under the VCRA for skirmishers. We recommend that you carry valid ID, your event ticket, and that IAA members carry their IAA membership ID card with them at all times. Most venues in the UK will issue a letter on request inviting you specifically to the site. An email or an e-ticket would also be adequate to prove you are in the UK as an airsoft skirmisher. This makes everyone’s job much easier. Most Police forces in the UK now have to log every interaction with the public, so you may or may not have to confirm your name and address and sign a little contact record card. Northern Ireland has the same 1 joule limit as the Republic. The actual limit in Britain depends on the site you’re going to and is usually 1.1J for AEGs and sometimes up to 1.35J for sniper rifles. All 20 member sites of the United Kingdom Airsoft Sites Governing Body (UKASGB) already observe the 1 joule limit, albeit with a discretionary +10% as the 1 joule is not yet enshrined in law in mainland Britain. We expect that the limit in Scotland will be reduced to 1J soon, and that England and Wales will follow. If you upgrade when you arrive, don’t forget to downgrade it again before you return. The accepted way to transport a replica firearm by land is in a closed bag or case and out of sight, preferably in the boot of your car. These are the sea and air-based carriers that we are aware will take a RIF on board. We recommend you call your carrier in advance in case rules have changed, but this list is current as of Summer 2010. By Sea – Stena Line is the only sea-based carrier we are aware of that will carry either real firearms or RIFs. Irish Ferries do not accept firearms or replicas. You must declare your gear at checkin, where a member of Harbour Police may inspect it before allowing you on board. They will also ask whether you are carrying ammunition. This means real ammunition, the ferry has to know about this in case of fire. The answer is “no, just the plastic pellets”. Your airsoft devices will stay locked in your car while the ferry is at sea. You’ll often get priority boarding, which is nice. If you are travelling as a foot passenger, your gun bag will be locked in the Purser’s safe for the voyage. By Air – Airlines we have had members fly successfully on are Aer Lingus (EI), SAS (SK) and flybe (BE). Ryanair (FR), Aer Arann (RE), CityJet (AF/WX) and bmibaby (WW) do not accept firearms or replicas. All airlines use the same Conditions of Carriage, which you can check on their website. This says that “Passengers are not permitted to carry the following items into the Security Restricted Area and the Cabin of an aircraft: (A) Guns**, firearms & weapons, any object capable or appearing capable of discharging a projectile or causing injury”. That includes replicas, and they’re always treated as real. Your airsoft device must be declared at checkin (and you can’t checkin on line), and packed in a hard-sided lockable case. We recommend that you carry any batteries in a different case, in your carry-on bag if possible. If asked whether you’re carrying ammunition, the answer is “no, just the little plastic pellets”. Any case that has hard sides and either key or combination locks is OK. If it doesn’t have it’s own locks, you can buy some of those little padlocks they sell at the airport and seal it that way. You can expect to be asked to lock it up after the contents have been inspected at the “special baggage” area. Also, gas is a prohibited item aboard aircraft. This includes Red/Green/Black Gas, which is just propane with the smell washed out and silicone oil added. You’ll have to make other arrangements for gas. Note: HFC22 (Chlorodifluoromethane) and HFC143a (1,1,1,2-Tetrafluoroethane) are non-flammable, but qualify as compressed gases and can’t be carried either. 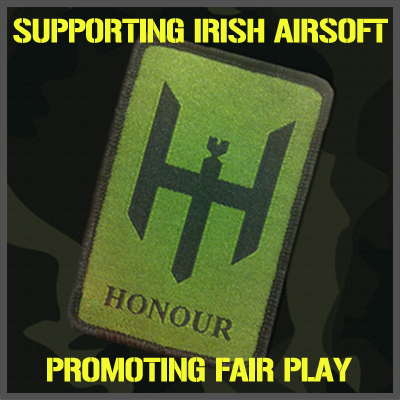 Another popular destination for Irish airsofters is Sweden, due mainly to Berget the premier annual airsoft event. Airsoft guns are classed as toys in Sweden, and there should be no issue in carrying them. Air – SAS is the only airline that will take airsoft gear into Sweden. Be sure to add the “Sporting Weapons” option onto your ticket to avoid excess baggage charges on the day. Failure to declare a “Sporting Weapon” (no, we don’t like that word either) at checkin will lead to delays and may lead to you being refused permission to board. SK allows sporting equipment to weigh up to 60kg. However, SK have recently begun to enforce a limit of one gun per case. SAS will probably attach a “Firearm” tag to your case. This is standard international procedure, though some airlines do it and some don’t. Just remember to take the tag off after you go through Customs to avoid causing alarm to the public. DON’T panic. Remember that Customs cannot confiscate or destroy your kit without good reason – like being over 1 joule. Text: Dave O’Connor, Bernard Lyons.